"And that's when I decided - enough is enough." Netflix has unveiled the dazzling official trailer for an indie dramatic comedy titled Dumplin', the latest from filmmaker Anne Fletcher (Step Up, 27 Dresses, The Proposal, The Guilt Trip). The film is about a teen named Willowdean, the plus-size daughter of a former pageant queen who decides to enter the beauty contest herself in protest, revolutionizing the pageant and their small Texas town. Jennifer Aniston stars with Danielle Macdonald (who also appeared in Patti Cake$) as Will. The cast includes Odeya Rush, Dove Cameron, Bex Taylor-Klaus, Luke Benward, Harold Perrineau, Joshua Eads-Brown, Sam Pancake, and Dan Finnerty. This looks like a joyously energetic and spirited film, better than I was expecting it to look. Might be worth a watch when it's released. Dumplin' follows an outspoken plus-sized teenage girl named Willowdean (Danielle Macdonald), who’s known as Will to her friends and Dumplin' to her mother (Jennifer Aniston), a former beauty queen winner who now runs the local Miss Teen Blue Bonnet pageant. In her small Texas town, Will confidently ignores comments about her weight and listens to Dolly Parton songs obsessively. But when she decides to enter her mother's pageant in protest, her bold move inspires other contestants to follow in her footsteps, redefining the town's traditions in the process. 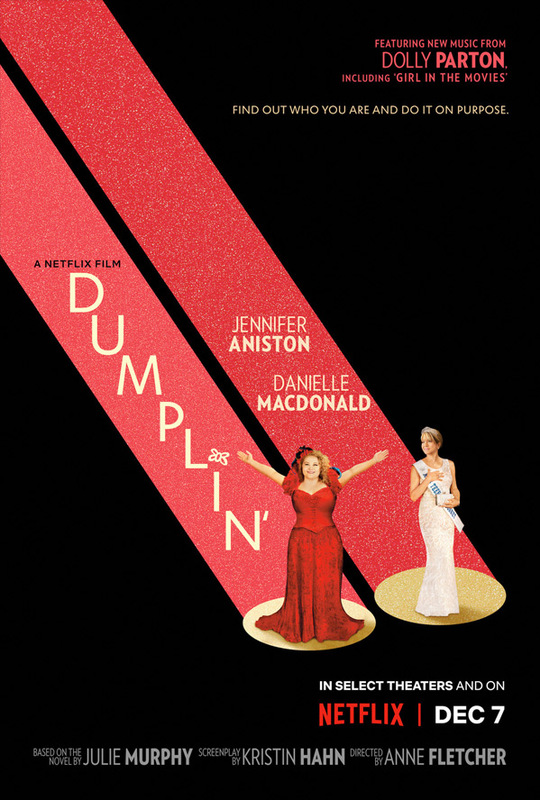 Dumplin' is directed by American filmmaker / dancer / choreographer Anne Fletcher, director of the films Step Up, 27 Dresses, The Proposal, The Guilt Trip, and Hot Pursuit previously. The screenplay is written by Kristin Hahn, adapted from the novel by Julie Murphy. Netflix will release Fletcher's Dumplin' streaming + in theaters select starting December 7th. Interested?